A Happy Halloween Give Away! Today is my youngest grandson's first Halloween! 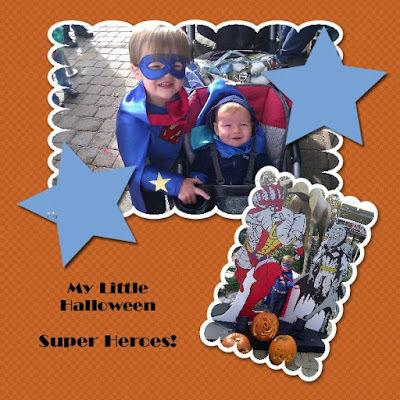 He and his older brother are dressing up as Super Heroes, along with their Mommy and Daddy. I always enjoy seeing entire families dressed up in costumes as they accompany their children from house to house for Halloween "trick or treat" .... sometimes even the family dog is in costume! The snowstorm that hit the North East this weekend had very little effect on where I live in Brooklyn, so I'm expecting a busy afternoon giving out Halloween treats, and I'm also excited to offer a special MY MEMORIES FREE DIGITAL SCRAPBOOK give away treat to all of my readers today! 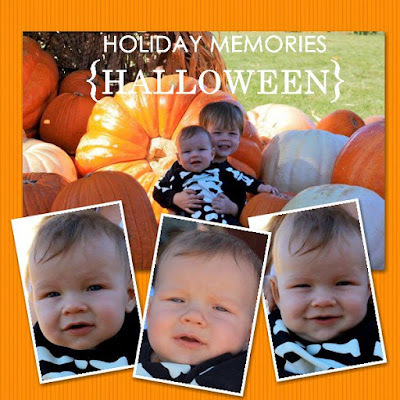 I was able to make this darling photo scrapbook page of my grandson's recent visit to their local pumpkin patch using the My Memories digital scrapbook software. My Memories Suite is the #1 rated scrapbook software and the best seller at Amazon for a reason. It is affordable and easy to use. When the folks at My Memories offered to let me try out their software I was so excited! 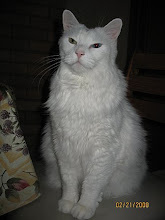 As you can imagine, I have so many digital photos of my grandsons, yet I have not been good as I had hoped at keeping up with having them printed out to make a scrapbooks with them. Now I can easily make digital scrapbook pages, and have them printed out up to 12x12 size at home, or send them out for professional printing. It's a nice way to use multiple photos on one page as well as journal a story about the photos. The software was easy to install and use. The page above was my first attempt! Just look at how easy it was to scrap my two little Halloween Super Heroes in a page I made last night! I can even turn my digital scrapbook pages into a movie to watch on a DVD, view on an iPod, or post them as a movie on my facebook page -- all with the click of a button! I am going to have lots of fun exploring all the options this software has to offer, such as making greeting cards, calendars, posters or trading cards, and bound photo albums. My Memories has generously offered to give a free download of a My Memories Suite v2.0 software, worth $39.97 USD to a reader of my blog. The software works for both PC's and Macs, and it is easy to install and use. Go to the My Memories web site on this link and then come back to my blog and tell me what was your favorite digital paper pack or layout. For even more chances "like" the My Memories facebook page, or follow them on Twitter or follow the My Memories blog for even more fun! Just let me know what you have joined in separate comments for more chances to win. For even another chance of winning, in a separate comment let me know you became a follower of my blog or let me know you are already a follower. That's up to five chances to win! I will use the Random Number Generator to chose the winner on Tuesday, November 8, 2011, and I will announce the winner on my blog. Please make sure I also have a way to contact you in your comments, in case you are the winner. If you'd like to purchase the My Memories digital scrapbook software today, you can do so by clicking here. As an added bonus, if you enter this code STMMMS34516 you will be provided with a special $10.00 discount off the purchase of the My Memories Suite Scrapbook software and a $10.00 coupon for the MyMemories.com store - $20.00 value! You can finally begin to organize your children's or grand children's photos, your vacation photos, or your recipes, along with photos of your food creations from your blog. Just think of the wonderful bound photo books you can make just in time to give as gifts for the holidays! 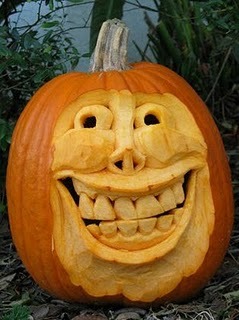 Happy Halloween and good luck! Many thanks to all the blog hosts. Edited 11/8/2011: Comments closed--winner has been chosen! Thanks to all who entered the give away! at checkout on tis link: http://www.mymemories.com/digital_scrapbooking_software It's a wonderful deal! This was my second visit to the beautiful Hotel Del Coranado located on Coranado Island located in San Diego's Bay. Built in 1888, this classic beach front hotel has long been heralded as one of America’s most beautiful beach resorts. 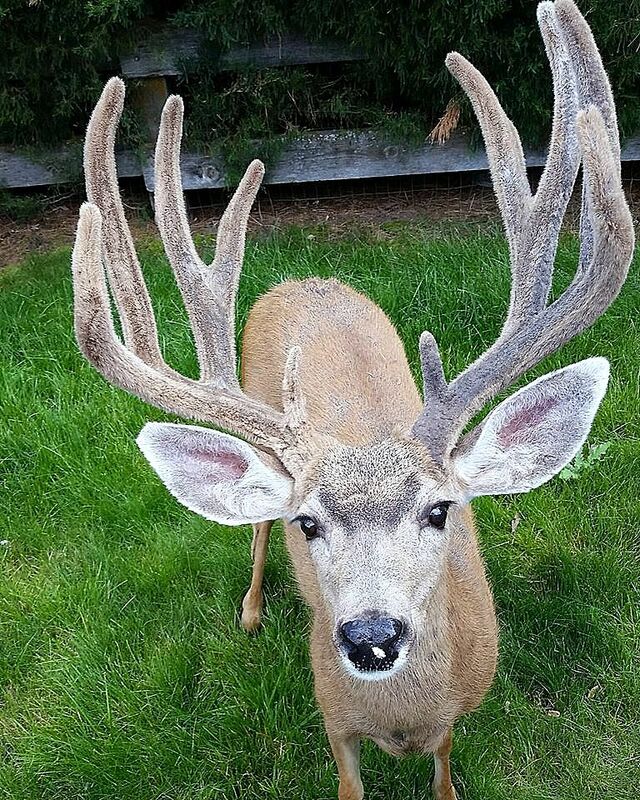 Nicknamed "The Del," it was designated a historic landmark in 1977. Eleven U.S. Presidents have visited The Del, starting with Benjamin Harrison in 1891. One of the resort's most famous visitors was England's Prince of Wales in 1920. He would later become King Edward VIII, only to give up his throne in 1936 to marry Coronado divorcee Wallis Spencer Simpson. Many have speculated that they may have first met at The Del. The Del has played host to some of America's greats, including Thomas Edison, L. Frank Baum and Babe Ruth. Famed aviator Charles Lindbergh was honored at The Del in 1927 after his successful trans-Atlantic flight. At this lavish banquet, a replica of Lindbergh's "Spirit of St. Louis" circled the enormous Crown Room ceiling. Hollywood has been making movies at The Del since 1901. In 1958, The Del was the backdrop for the comedy classic "Some Like It Hot," starring Marilyn Monroe, Tony Curtis and Jack Lemmon. The resort has also seen a steady stream of celebrity visitors - from Charlie Chaplin and Humphrey Bogart to Brad Pitt and Madonna." ...and the equally wonderful array of gift shops located in The Del! ...for an occasional Navy jet practicing maneuvers overhead! The Del faces the Pacific Ocean with the large white sand Coronado Central Beach in between. From the beach you can see how enormous and beautiful the entire hotel is! I walked along the beach for quite some time as the cool breeze off the water was delightful. Point Loma, San Diego, can be seen in the distance. The water was quite chilly! Pumpkins, San Diego style, made out of beach sand! 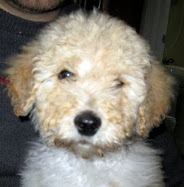 Be sure to come back for my Monday blog post to see an exciting give away! I'm linking this post to the "Mosaic Monday" event on Mary's blog Little Red House and "Blue Monday" event on Smiling Sally's blog. Thanks you to both wonderful hosts. 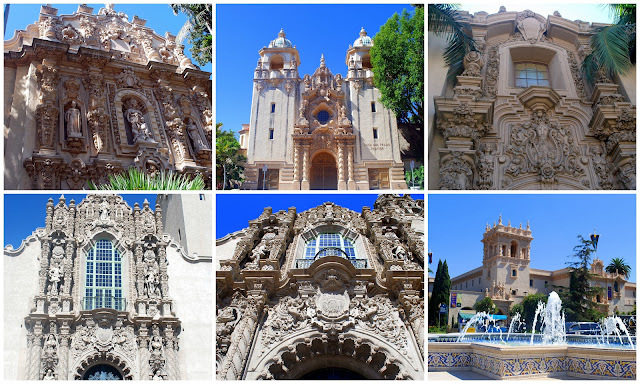 Balboa Park, located at 1549 El Prado, in San Diego, California, is the nation's largest urban cultural park, and home to 15 major museums, renowned performing arts venues, beautiful gardens and the San Diego Zoo. Balboa Park began as 1400 acres of land set aside in 1868 by San Diego civic leaders, and was then known as “City Park.” At that time it was merely a scrub-filled mesa that overlooked present city of San Diego. The first steps in the park's beautification were made in 1892, largely due to the contributions of Kate Sessions. Sessions offered to plant 100 trees a year within the park as well as donate trees and shrubs around San Diego in exchange for 32 acres of land within the park boundaries to be used for her commercial nursery. 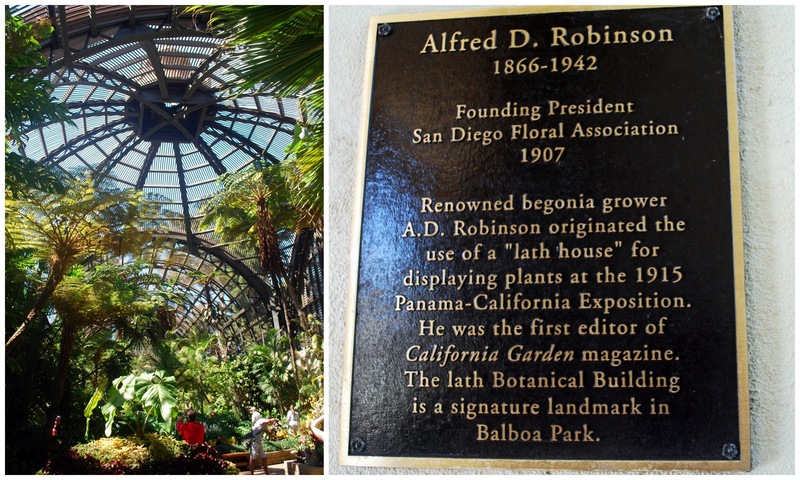 She is aptly known as the "Mother of Balboa Park." Balboa Park was the location of the 1915 Panama–California Exposition, and the Park Commissioners decided to name the park in honor of Spanish-born Vasco Nuñez de Balboa, the first European to spot the Pacific Ocean while on exploration in Panama. The very flamboyant "Spanish-Renaissance" style of architecture is what the commissioners felt would best represent the country of Panama. The 1935 California Pacific International Exposition created additional architectural landmarks in the park. 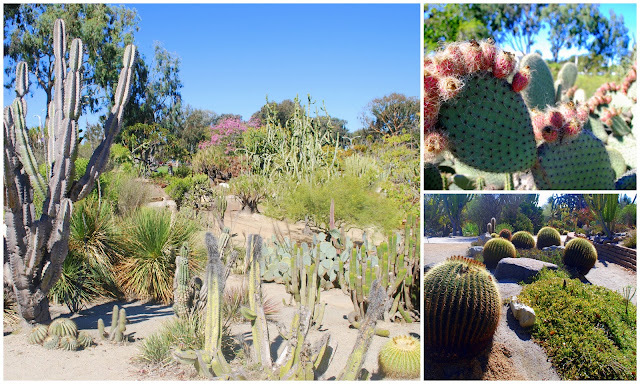 On my last visit to Balboa Park I visited a few of the museums and the world renown San Diego Zoo, which you can read about on this link. This time I planned to spend some time visiting a few of its many gardens that have free admission. The next place I visited within the park was the beautiful Botanical Building with its iconic Lily Pond in front. Built for the 1915-16 Exposition, along with the adjacent Lily Pond, the historic building is one of the largest lath structures in the world. The Botanical Building plantings include more than 2,100 permanent plants, featuring fascinating collections of cycads, ferns, orchids, other tropical plants, and palms. The Botanical Building also presents some of the Park's vibrant seasonal flower displays. The filtered light coming through the lath was very pleasant atmosphere. I enjoyed watching this group of plein air watercolor artists painting outside the Botanical Building. Next, I visited the two and a half acre Desert Garden, which contains more than 1,300 plants, including succulents and drought-resistant plants from around the world. San Diego enjoys a semi-arid and Mediterranean type climate, full with mostly sunny days, so this outdoor garden was really flourishing! Last, and my favorite garden of all, was the Inez Grant Parker Memorial Rose Garden. This three-acre garden displays approximately 2,500 roses of nearly 200 varieties! It is in bloom from March through December, with the roses usually at their peak in April and May. During my October visit the roses were plentiful and fragrant. I felt as if I were experiencing an endless summer as I strolled along the paths and around the fountains in this lovely, peaceful garden. I love roses and it is always a joy to see so many at one time. 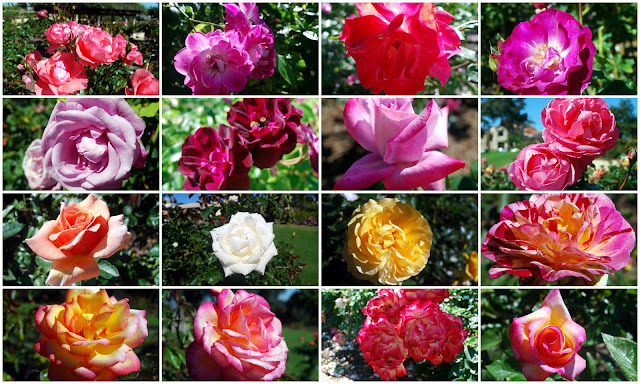 I'll leave you with a few of the many variety of exquisite roses I saw in bloom. 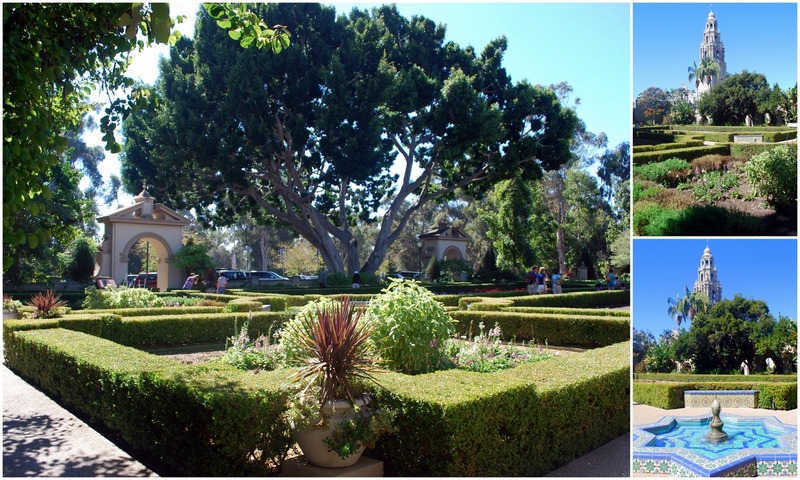 There are many more gardens located within Balboa Park and a full list with descriptions can be read on this link. One could spend an entire vacation visiting Balboa Park, and the best way to start your visit is with a stop at the Balboa Park Visitors Center, located across from The Prado Restaurant in the House of Hospitality. The Visitors Center has the most current and comprehensive information about the park’s activities and attractions, including free guided tours of the park, and is open from 9:30am-4:30pm daily. Next stop on my San Diego visit will be the beautiful and historical Hotel del Coronado and a special give away! 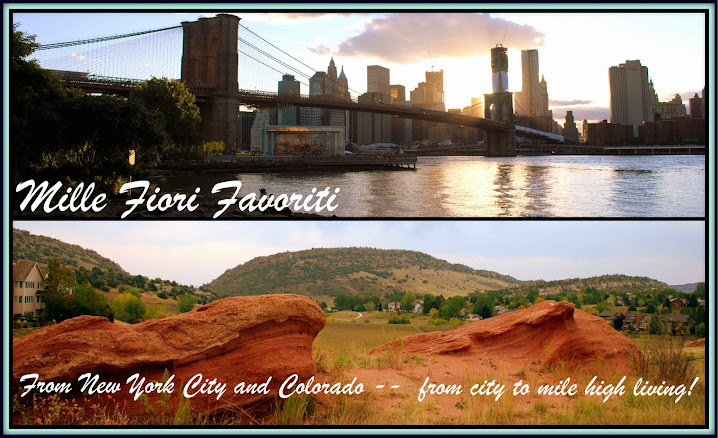 Many thanks to the blog event hosts! My husband had to attend a business convention in beautiful San Diego two weeks ago. He also had a business engagement in San Francisco scheduled for the following week. So instead of flying back and forth we decided to take some vacation time and drive up the Pacific Coast Highway, California State Route 1, between the two cities. This was the second time I visited San Diego. I went there in 2008 and some of my first blog posts were about this wonderful city, which you can read under the San Diego label on my blog by clicking here. This visit was shorter, but also quite memorable! Everything about this city seems to be blue -- between the bright blue bay water and the cloudless blue sky. 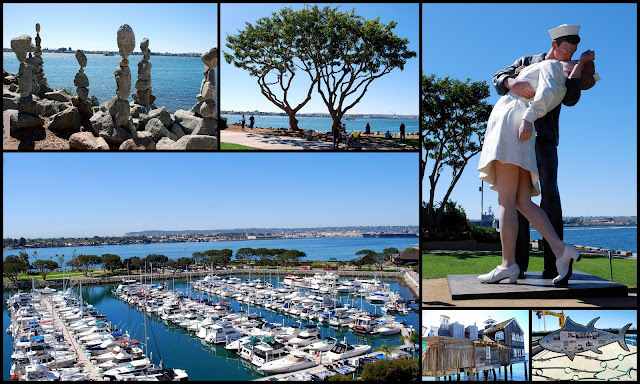 The scenes above were taken along the embarcadero and includes the statue “Unconditional Surrender,” which represents a famous photo taken by Alfred Eisenstaedt of a Sailor kissing a nurse in Time Square, New York City 1945, after the announcement of V-J Day. The statue is owned by the Sculpture Foundation of Santa Monica, Calif., and is on loan to the Port of San Diego. 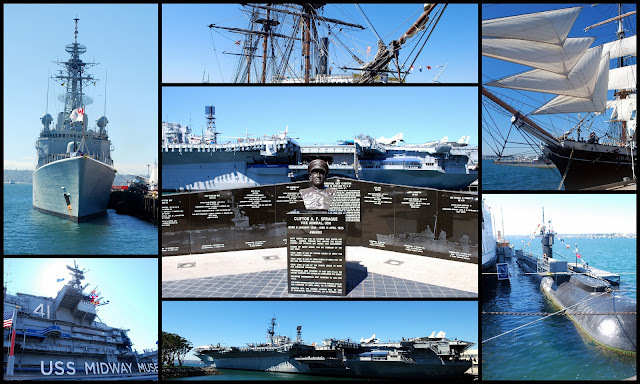 There is a strong US Navy presence in the big bay and many decommissioned ships are on display for visitors to view. It is amazing to see how large the Navy Aircraft Carrier Midway is! The U.S. Aircraft Carrier, "USS Midway" served 47 years, from the end of WW II to Desert Storm. By the time the Midway was decommissioned in 1991, more than 225,000 men had served aboard. It was virtually a floating city on the sea! Presently, The US Midway Museum has sixty exhibits and twenty restored aircraft on it to visit. 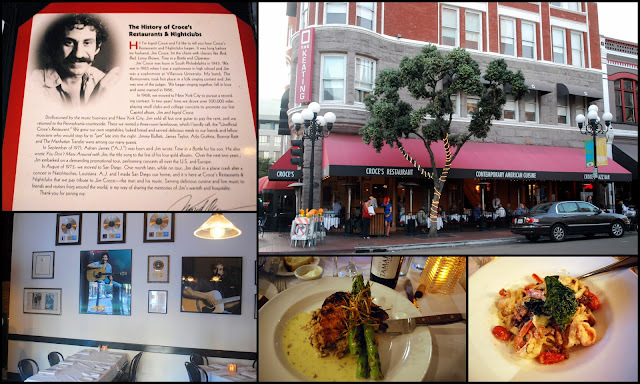 As this trip was so soon after our 37th wedding anniversary, we had a special dinner to celebrate at Croce's Restaurant and Jazz Bar, located at 802 5th Avenue in the historic Gaslamp quarter of San Diego. Our wedding song was "Time in a Bottle," written and sung by Jim Croce. Croce was sadly killed in a plane crash in 1973, and his wife opened this restaurant soon afterward. It was a very nostalgic place for us to dine and reminisce. My husband ordered the grilled free-range chicken with forest mushroom risotto, asparagus and rosemary vodka sauce with fried leeks, and I had the shrimp carbonara fettuccini with Italian pancetta, kalamata olives with basil in a white garlic cream sauce, everything tasted absolutely exquisite! Croce's Jazz Bar has live music every night of the week and on Saturday and Sunday mornings for Brunch. If you visit San Diego I highly recommend a special dinner at Croce's. 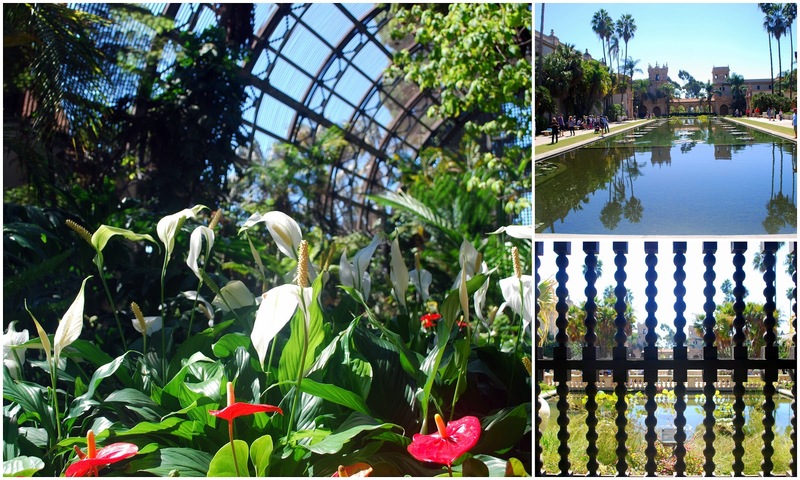 Come back for my next post where I'll show you some of the beautiful gardens in Balboa Park in San Diego! I'm linking this post to Mosaic Monday on Mary's blog Little Red House and Blue Monday on Sally's blog Smiling Sally. Thank you to both hosts. 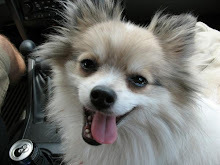 How Do You Stay Happy....$250 Sweepstakes! You have a million tasks on your "to do" list, errands to run, deadlines to meet, reports or blog posts to write. You have much work to be done, yet you feel tired, worn out, and just plain blocked? BlogHer posed the question "How do you stay happy and engaged while working?" to bloggers on their "Life Well Lived" editorial panel, and asked us to name in a few sentences one tip that we use to do just that. Can you guess my answer? The first thing I thought of was to open my windows -- pull up the blinds -- pull back the curtains and let the natural light and air fill my work area. Doing so never fails to invigorate me! Even the smallest window can let in a large amount of natural daylight which helps chase away the doldrums and boredom which can drag me down. I always feel more productive when I work in good light. Taking a few moments to look outside my window and virtually stretch my vision and my thoughts to a distant vista can be as relaxing as a mini vacation. It leaves me feeling refreshed and ready to get back to work. Intrigued? You can read more of what Dr. Amyee wrote on this link. While you are there please leave a comment and share the ways you help yourself, stay happy and engaged at work in the BlogHer comments section. It is also a nice way to introduce new readers to your blog and find other interesting blogs to read! You can also read the "Happy at Work" tips that other bloggers on the "Life Well Lived" panel suggested on this link. Enter to win a $250 Visa gift card on the BlogHer "Life Well Lived Moments" Sweepstakes by leaving a comment on the general little moments in life that make you happy on the Sweepstakes page on this link. The sweepstakes runs until November 16, 2011. Wouldn't winning a $250 visa gift card be a happy occurrence, especially with the holidays coming soon? One of the things that brings me many happy moments in my life is to travel and discover new things -- whether it be in my neighborhood, in my city, or on a vacation far away. In fact, I have been away the last two weeks in California, having a dream opportunity of driving up the Pacific Coast Highway with my husband from San Diego to San Francisco! It's always good to return home and now I have quite a bit to catch up on -- especially on all I missed on your blogs while I was away! As soon as I download all my photos I'll be back with all the wonderful sights and some sounds that we experienced in sunny California -- even a earthquake tremor or two! 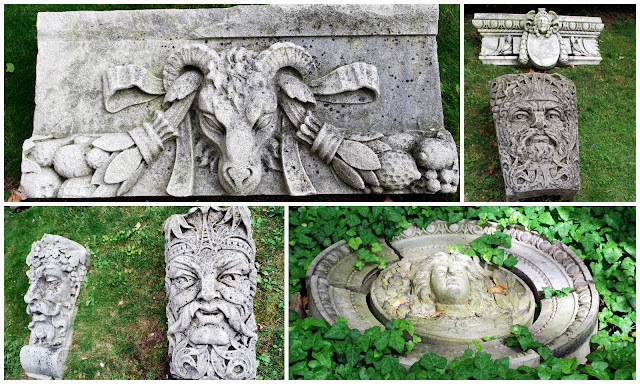 On a recent visit to the Brooklyn Museum I visited the Steinberg Family Sculpture Garden. Dedicated in 1966, it hosts a pre-eminent collection of terracotta, stone, and metal architectural elements salvaged from now-demolished structures throughout the metropolitan area and reinstalled outside the museum's Norman M. Feinberg entrance. Most of these remarkable objects date to the period between 1880 and 1910, recording a great era in the cultural, architectural, and industrial history of New York City. The Brooklyn Museum, located at 200 Eastern Parkway, Brooklyn, New York, is the second largest art museum in New York City. The museum opened in 1897, and the 560,000-square foot building houses a permanent collection including more than one-and-a-half million objects, from ancient Egyptian masterpieces to contemporary art. The outdoor collection offers varied examples of the forms created to enrich the facades of residential and commercial buildings. Scrolls and garlands, fruit and flowers, cornucopias and shells, and geometric and foliate patterns abound, as do human and animal forms and fantastic creatures all simplified into architectural units such as keystones, friezes, moldings, lunettes, and plaques, that once adorned buildings in New York City. Much of the work was executed by anonymous stone carvers, mostly immigrant workers from the United Kingdom and, later, Italy, who traveled from building site to building site. By the turn of the century, however, a large portion of this work would no longer be done by hand, as factory-produced terracotta tiles replaced most of the hand-carved stonework on New York buildings. A number of the objects in the collection were also designed by well-known artists and architects, including Louis Sullivan; McKim, Mead and White; Irwin S. Chanin, and Gutzon Borglum. "This slumbering female figure once stood beside a huge clock above an entrance to the original Pennsylvania Station. The vast complex, completed in 1910, was designed by Charles Follen McKim and modeled after the Roman Baths of Caracalla. Each of four pedestrian entryways to the terminal was surmounted by a clock flanked by two allegorical figures representing time. Day held a sunflower, and the hooded Night, seen here, bears a drooping poppy. The terminal building was demolished in 1963. 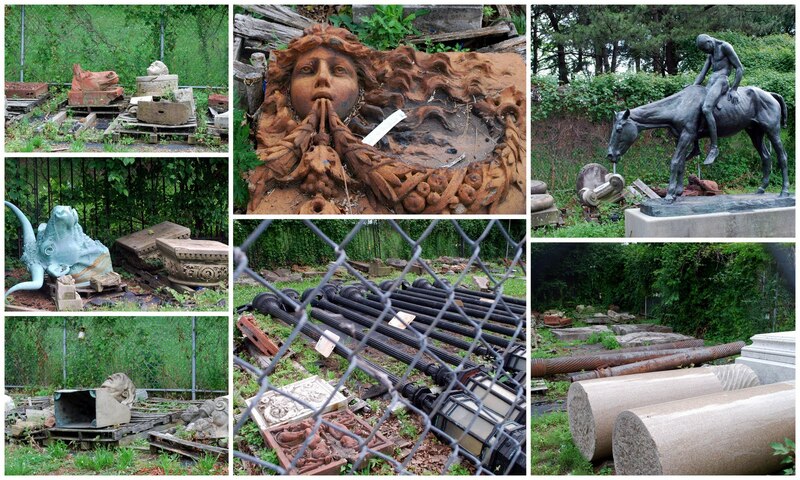 This sculpture was retrieved from landfill in the New Jersey Meadowlands." "Perhaps no American symbol is more widely recognized or powerfully expressive than Liberty Enlightening the World—the Statue of Liberty, erected on Bedloe’s Island in New York Harbor in 1885. This thirty-foot replica was commissioned around 1900 by the Russian-born auctioneer William H. Flattau to sit atop his eight-story Liberty Warehouse, then one of the highest points on Manhattan’s Upper West Side. Flattau combined his entrepreneurial spirit with pride in the adopted country in which he had prospered." A popular fixture of the Upper West Side for more than a century, this Statue of Liberty replica was removed in 2002 when the warehouse was sold and renovated for use as an apartment building. These sleek modernist versions of Pegasus, the flying horse of classical mythology, once flanked the entrances to the New York City Fire Service Pumping Station that still stands on Neptune Avenue between West Twenty-third and West Twenty-fourth Streets. The station boosted water pressure for fire fighting in outlying areas of Brooklyn. These four pairs of winged horses arise from stylized curving forms that suggest waves or clouds. Their compact double profiles reflect the Art Deco style of the industrial building whose entrances they once adorned. The streamlined design style was widely used in the 1920s and 1930s. When the building was modermized they were sadly removed from the facade. "This ferocious creature was one of a trio of rearing lions that originally pulled a chariot atop the entrance pavilion to the giant El Dorado Carousel at Coney Island. Germany’s leading amusement-ride manufacturer, Hugo Haase of Leipzig, built the spectacular carousel in 1902 for Wilhelm II, emperor of Germany and king of Prussia. In 1910 it was imported by Coney Island empresario George Tilyou and installed near the Dreamland amusement park, at West Fifth Street and Surf Avenue. Though only one of several independent carousels at Coney Island, the El Dorado was, according to carousel expert Frederick Fried, “the most ornate, most publicized, and one of the largest” in America. The carousel and its entrance pavilion were relocated several times and eventually separated. The latter was dismantled in 1964. The carousel is still in use at the Toshimaen Amusement Park in Tokyo." at Liberty and William Streets, Manhattan. "Winged Dragon Chimera -This fierce and fantastic creature, sitting on his haunches and clutching a shield, seems to be a cross between two mythical monsters: a griffin (with an eagle's head and wings and the body of a lion) combined with a dragon. This lively sculpture came from the facade of a building that formerly stood in the financial district in Lower Manhattan." formally at 813 Fifth Avenue, Manhattan. "Set of four limestone Atlantes (sculptural supports in the form of a man). Four bare-chested men with drapery around their waists, attached at back to pilasters, and supporting a now missing ledge with arm or arms. Two hold both hands over heads; two have one arm above head, other arm holding drapery. The figures adorned the facade of the Hugh J. Chisholm house until 1961, when the structure, along with two adjoining houses, was torn down to make way for an apartment building." A close up of one of the Atlantes figures. Unfortunately, many other examples of vintage New York City architecture languish in limbo behind the museum's parking lot fence. Over ten years ago, the Brooklyn Museum dismantled the sculpture garden during a reconstruction of its rear entrance and expansion of the parking lot, and reinstalled a far sparser sculpture garden, using the more notable fragments shown earlier in this post. Other pieces with less historical value or identification were left on wooden pallets in a rubble pile and left to the elements. I never visit the museum without peeking through the chain link fence at these objects as I find them beautiful and interesting and I feel sad about their neglect. A very interesting article about these artifacts can be read on this Atlantic Magazine link. The Brooklyn Museum opened a forum for questions after the Atlantic article was printed, which can be read at this link. It seems with current budget constraints museums are hard strapped to provide the funding to showcase collections such as these. Unfortunately, The New York City Landmarks Preservation Commission was also faced with having to deal with losing their architectural salvage program due to budget constraints, and they recently offered their artifact collection at auction. 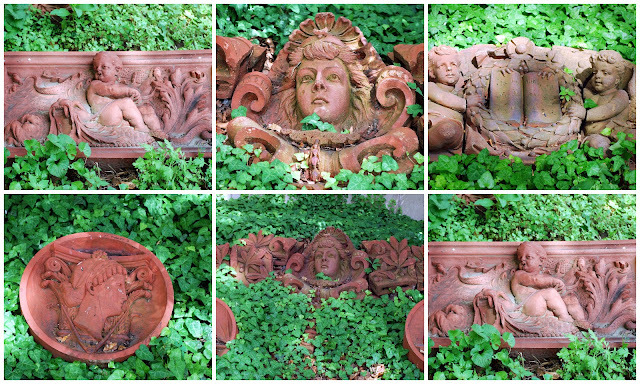 Hopefully, there will soon be a solution to what to do with future pieces of vintage decorative and functional New York City architecture so their beauty will be preserved for future generations. The Preservation League of New York State is dedicated to the protection of New York’s diverse and rich heritage of historic buildings, districts, and landscapes. It is now working to provide a united voice for historic preservation. Since 1999, the Preservation League has highlighted New York’s most threatened historic resources and their Intervention Program allows the Preservation League to intervene directly when historic buildings are threatened with disinvestment, neglect, and demolition. What is being done in your area to preserve historic architecture and landmarks? It is something we should all be concerned about! 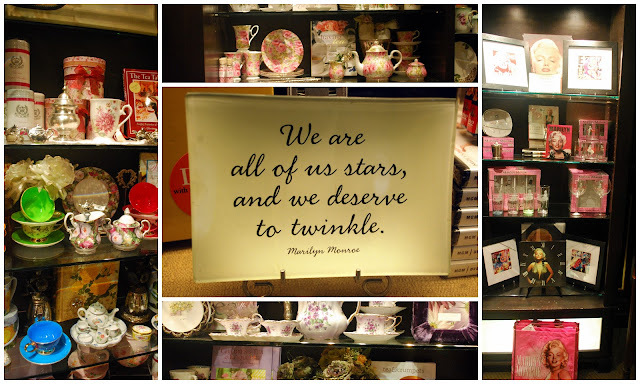 I am adding this post to the "Mosaic Monday" event on Mary's blog The Little Red House and the "Outdoor Wednesday" event on Susan's blog A Southern Daydreamer. Thanks to both hosts! Viewing "The Chew" With Best Friends!